Christian Charisiou and Elise McCann. Photo: Phil Erbacher. Can there be a bigger gulf in the world of musical theatre than seeing Saturday Night Fever and The Last Five Years on successive nights? The dance-focused former has a skeletal story and functional music; the latter is a bold piece of conceptual and compositional ingenuity. 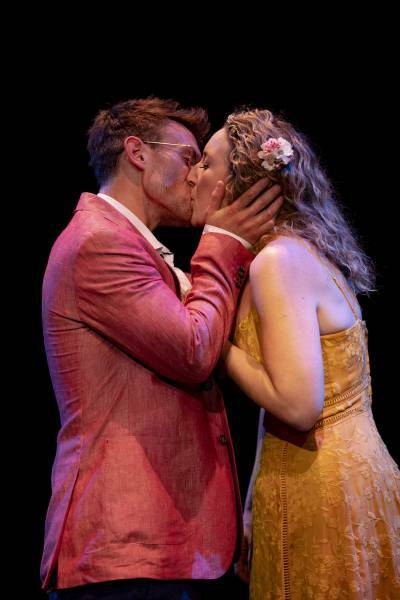 Now 18 years old (and in its third Sydney season) Jason Robert Brown’s 90-minute two-hander about a five-year relationship was so candidly autobiographical that he had to rewrite one of the songs to diffuse legal proceedings by his ex-wife. Dramatists have struggled to depict love affairs from “Wow!” to “Go!” with a credible level of emotional complexity. Shorthand versions don’t cut it. Brown’s astoundingly innovative solution was to tell the story forwards and backwards simultaneously – and in song! So Cathy’s first song is about Jamie (Christian Charisiou) having left her, while Jamie’s first is about having just met and been smitten by Cathy (Elise McCann). The time-lines meet in the middle with their wedding, the only time the two characters actually sing with and to each other. Were this merely an intellectually clever inversion of chronology it would amount to little, but, as these two narratives intersect, they don’t just bend time, they bend perspective. The glowing love and yawning wasteland between the two hearts becomes an intricate emotional militarised zone, cross-hatched by the shadows of the other party’s feelings. Their affair is further complicated by Jamie being an author whose star is in the ascendant, and Cathy an actor whose star has fallen so low as to be touring bleak Ohio rather than successfully scrounging a role in New York. Brown cuts no corners with these characters, drawing them with a sophistication that was previously uniquely Stephen Sondheim’s domain in musical theatre. They are flawed, raging, caring, funny people, who sing songs in which the lyrics flare with ingenious rhymes, while the music is wildly diverse, innovative, edgy and sometimes delicately beautiful. Elise McCann. Photo: Phil Erbacher. His is an electrifying performance in terms of complexity, nuance and both vocal and physical energy. McCann, by contrast, fills Cathy to the brim with charm, sweetness and pathos, although her singing is much more uneven. When softly singing introverted sentiments, or when being comical (depicting an audition), she’s captivating, but when she really sings out to express bigger or rawer emotions the timbre of her voice becomes too brittle and shrill. If there is no immediate remedy for this she would simply be better off not singing as loudly. Although the show was originally scored for sextet, this was, alas, another Sydney incarnation with just piano accompanist (musical director Daryl Wallis). Michael Scott-Mitchell’s bare-stage set has two small revolves that director Elsie Edergeton-Till uses to create metaphorical implications of the two timelines passing like trains. It’s a show of such fascination as repays repeated scrutiny, and were McCann’s singing able to match the consistency of Charisiou’s, it would be exceptional. As it is it’s still very good.